Please refer back to this page during your Induction weeks in case of last minute changes. bring with you any documents, etc where these are specified. If you have not already done so, please upload a photograph of yourself using the e@applicant page and following the online instructions. Overview of support services available for all students of the University of Plymouth and an introduction to the Portland Square Faculty Office by Debbie Couch and Roxanne Treloar. How we communicate with you; contact details; opening hours; reporting absences; extenuating circumstances; travel information and University health and safety. You will meet your PBL group and be introduced to the Peninsula 8-step process for PBL along with some of the key skills needed to take part in sessions. An overview of patient safety, its definition and how this is represented in the 5 years of the BMBS curriculum. There will be active discussion of some high profile cases where patients' safety was compromised and an opportunity for students to identify where the shortfalls were. The plenary will also highlight the responsibility of students in maintaining patient safety at all times and how this could be optimised. There will be a specific mention of the FoMD raising concerns policy and who students can contact if they have a concern. Your PBL group will lay down the key foundations for how the group will function. You will begin to learn how to unravel the issues from a case scenario. In your second PBL group session you will complete the 8-steps of PBL, share your findings for the questions you created in the first session and give feedback. A tour around our fantastic library. 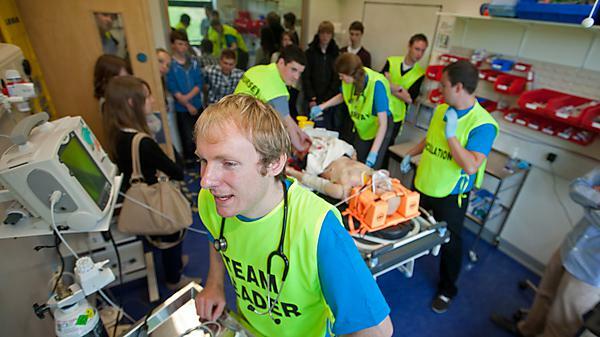 outline the help and support available to you in planning your medical career. Exhibitors will include: University of Plymouth support teams, various student societies and external exhibitors e.g. Medical Defence Union, Medical Protection Society and HM Forces. This introduction to LSRC will give you an idea of the extensive array of resources available to you and what to expect during these teaching sessions and how to approach learning in this new environment. It also kicks off your anatomy learning. This session includes an introduction to anatomical terminology and surface anatomy to get you started learning this new language and understanding its importance in the clinical setting. What is professionalism? Does professionalism matter? Is professionalism inherent or can students learn to become more professional? Why is professionalism assessment a key component of foundation doctor selection? This session will discuss the importance of the professional challenges that we face in our daily work using case examples to illustrate points and principles. The methods of teaching and assessing professionalism within FoMD will be discussed. Sessions for Anatomage take place in C303 C block, Portland Square building. Please note that only half of each group will attend these sessions and this will be allocated when you arrive. Your community attachments this year will introduce you to some of the many agencies working to improve health in Plymouth. Over the next 5 years you will be part of that effort. This session will help you to prepare for your community placements and jigsaw sessions to maximise the learning opportunities. This session will also help you to understand the good, the bad and the ugly of health in the city! An overview of the principles and practice of assessment within the medical curriculum, with emphasis on summative assessments (medical knowledge, clinical skills, personal development and professionalism, and student selected components in years 1 and 2) and the requirements for progression from year 1 to year 2. In every patient encounter, there are a range of 'toolkits' on which a doctor must draw. These are really systems of knowledge that we use to help patients, such as biomedical science, evidence-based practice, professionalism, humanities, population health, ethics, psychology and sociology. This session will demonstrate how the FoMD curriculum teaches students to integrate all these themes into clinical practice. An introduction to the role of student representatives and how we collect and use your feedback on your experiences of the course. An opportunity to ask any final questions to staff before the core programme starts the following week. 2. Contraception – from free condoms to longer term contraception solution such as implanons and IUCDs.